At 4 p.m. 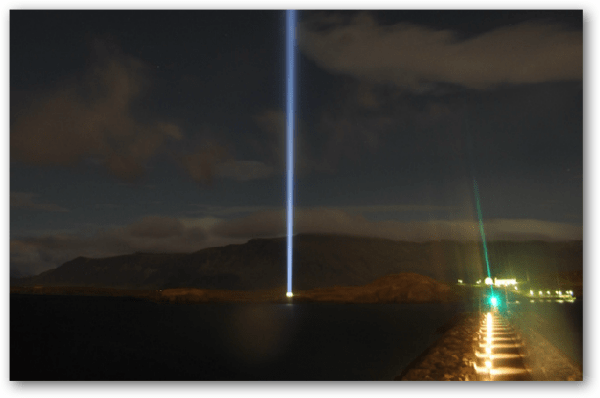 ET, the annual lighting of the John Lennon Imagine Peace Tower kicked off a month-long optical tribute to the murdered Beatles artist. And this year his widow Yoko Ono is live streaming it. The Imagine Peace Tower is an ambitious undertaking. It’s lit each year in Iceland — in a ceremony led by Ono –on October 9 and stays lit until December 8. The dates note Lennon’s birthday and the date of his death, respectively. Check out the tech behind the tower. It includes 15 searchlights, condensers and mirrors to concentrate a single, pointed beam of light straight up — 4,000 meters up. At its base are the words Imagine Peace — the words are in 24 different languages. Buried beneath that, according to Ono, are some half million cards and notes Lennon fans have sent the family since Lennon’s 1980 murder. Officially turned on for the first time in 2007, the Peace Tower is in Vioey Islan, Kollafjorour Bay, in Reykjavik, Iceland. To tweet a wish for peace, Yoko Ono asks that tweets come to the Imagine Peace Tower’s Twitter handle @IPTower. You can also join the Imagine Peace Tower Facebook page. You can’t have a John Lennon Imagine story without the world famous song. Here’s the official video from YouTube.